Crisis and trauma happen at unpredictable times day and night. No one is impervious, even in Tustin auto towing is subject to the whims of fate. This is why Bee Towing is proud to be a part of the Tustin community with many years of experience, helping Tustin drivers out of the worst situations that call for emergency towing and roadside assistance. Auto towing is an important service, so here at Bee Towing we have worked hard to make our policies of 30 minutes response time from their 24/7 dispatch service as well as their honest pricing policy conducive to providing the very best for Tustin drivers. Fully licensed and bonded Bee Towing is the towing company you can trust. When bad situations occur, you don’t need to be caught in a position that leaves you wanting for dependable and reliable assistance. Bee Towing is the leader in reliable 24 hours emergency towing service Heavy Duty Towing, Flatbed Towing & Long Distance Towing. Auto towing ,Motorcycle Towing , Tow Dolly and Private Property Towing is something of a calling for our well-trained technicians. Resolving those emergency towing situations is done quickly and efficiently. With our 30 minutes response time and twenty four hour service there is no doubt we’ll be there for you when you need us. Sometimes what we really need is not just someone to tow us away, but a little help getting back on the road after a surprise incident. 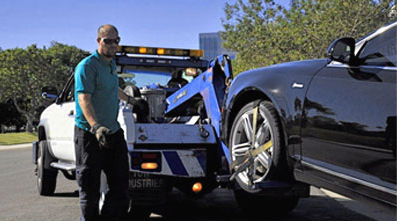 From a dead battery jump start to a flat tire fix or car lockout solutions Bee Towing has the most complete roadside assistance services in Tustin. Roadside assistance means something special to us at Bee Towing Tustin; it means getting drivers back on the road is more important than taking care of a job quickly. When car lockout distresses you in a parking lot, Bee Towing Tustin is more than happy to show up with the car lockout solutions we have been trained to provide. We can even help with car key replacement to remedy car lockout. If you need a flat tire fix, crouching on the side of the highway is not a smart plan. That’s why Bee Towing provides flat tire fix service with our roadside assistance. A flat tire fix is a simple fix when you have help. Even a battery jump start is easier with the equipment Bee Towing Tustin has for quick battery jump start. Providing for all the cares Tustin drivers have, from battery jump start to emergency towing, Bee Towing is the towing service to count on.